These results, published Monday Oct. 16, 2017 in an open-access paper in the Journal of Cognitive Enhancement, suggest it’s possible to train the brain like other body parts — with targeted workouts to improve the cognitive skills needed when tasks are new and you can’t just rely on old knowledge and habits, says co-author Susan Courtney, a Johns Hopkins neuroscientist and professor of psychological and brain sciences. The dual n-back game is a memory sequence test in which you must remember a constantly updating sequence of visual and auditory stimuli. As shown in a simplified version in the video above, participants saw squares flashing on a grid while hearing letters. But in the experiment, the subjects also had to remember if the square they just saw and the letter they heard were both the same as one round back. As the test got harder, they had to recall squares and letters two, three, and four rounds back. The subjects also showed significant changes in brain activity in the prefrontal cortex, the critical region responsible for higher learning. With the easier complex span game, there’s a distraction between items, but participants don’t need to continually update the previous items in their mind. The next step, the researchers say, is to figure out why dual n-back is so good at improving working memory, then figure out how to make it even more effective so that it can become a marketable or even clinically useful brain-training program. * Scientists trying to determine if brain exercises make people smarter have had mixed results. 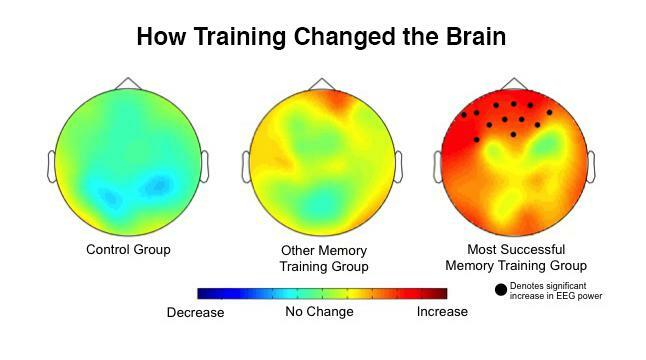 Johns Hopkins researchers suspected the problem wasn’t the idea of brain training, but the type of exercise researchers chose to test it. They decided to compare directly the leading types of exercises and measure people’s brain activity before and after training; that had never been attempted before, according to lead author Kara J. Blacker, a former Johns Hopkins post-doctoral fellow in psychological and brain sciences, now a researcher at the Henry M. Jackson Foundation for Advancement of Military Medicine, Inc. For the experiment, the team assembled three groups of participants, all young adults. Everyone took an initial battery of cognitive tests to determine baseline working memory, attention, and intelligence. Everyone also got an electroencephalogram, or EEG, to measure brain activity. Then, everyone was sent home to practice a computer task for a month. One group used one leading brain exercise while the second group used the other. The third group practiced on a control task. Everyone trained five days a week for 30 minutes, then returned to the lab for another round of tests to see if anything about their brain or cognitive abilities had changed. Working memory (WM) is the ability to maintain and manipulate task-relevant information in the absence of sensory input. While its improvement through training is of great interest, the degree to which WM training transfers to untrained WM tasks (near transfer) and other untrained cognitive skills (far transfer) remains debated and the mechanism(s) underlying transfer are unclear. Here we hypothesized that a critical feature of dual n-back training is its reliance on maintaining relational information in WM. In experiment 1, using an individual differences approach, we found evidence that performance on an n-back task was predicted by performance on a measure of relational WM (i.e., WM for vertical spatial relationships independent of absolute spatial locations), whereas the same was not true for a complex span WM task. In experiment 2, we tested the idea that reliance on relational WM is critical to produce transfer from n-back but not complex span task training. Participants completed adaptive training on either a dual n-back task, a symmetry span task, or on a non-WM active control task. We found evidence of near transfer for the dual n-back group; however, far transfer to a measure of fluid intelligence did not emerge. Recording EEG during a separate WM transfer task, we examined group-specific, training-related changes in alpha power, which are proposed to be sensitive to WM demands and top-down modulation of WM. Results indicated that the dual n-back group showed significantly greater frontal alpha power after training compared to before training, more so than both other groups. However, we found no evidence of improvement on measures of relational WM for the dual n-back group, suggesting that near transfer may not be dependent on relational WM. These results suggest that dual n-back and complex span task training may differ in their effectiveness to elicit near transfer as well as in the underlying neural changes they facilitate.